We still have 9 spots left! Like cooking chili? Have a secret family recipe? 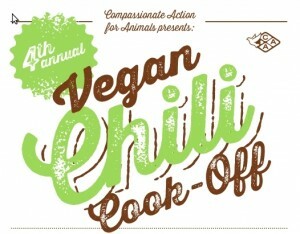 Then you might have what it takes to win 1st place at CAA's 4th Annual Vegan Chili Cook-Off! Registration costs $20. Awesome animal-friendly prizes will be awarded to the top three recipes as determined by popular vote. Contestants must bring 24 cups of prepared vegan (no animal products) chili, a list of ingredients, and a crock pot (or something without an open flame to keep your chili warm). The 4th Annual Vegan Chili Cook-Off takes place on Saturday, March 2 at the First Unitarian Church, 900 Mount Curve Drive, Minneapolis. Beverages will be provided for washing down some spicy chili. Over 150 people attended last year's cook-off, and we expect a similar crowd again this year! Check out the Facebook event and invite your friends.